Joe Dan Lowry is one of the world&apos;s leading turquoise experts and the author of Turquoise: The World Story of a Fascinating Gemstone. Joe Dan&apos;s family has been involved in the turquoise industry for five generations and he is also the developer and curator of Albuquerque&apos;s Turquoise Museum. The Indian Pueblo Culutral Center&apos;s Shumakolowa Native Arts team recently visited Joe Dan Lowry at the Albuquerque Turquoise Museum to get the low-down on turquoise in New Mexico and internationally. Most people don&apos;t know that turquoise is a global gemstone. China is the number one producer. Mexico is number two. 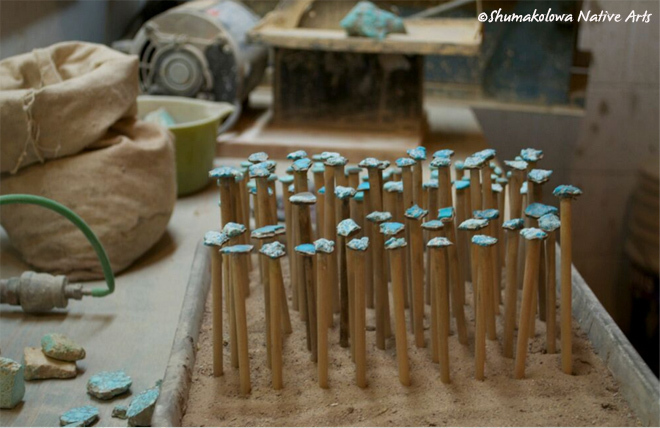 It&apos;s a global art form that uses turquoise. When you go into Santa Fe or Old Town or Gallup, you&apos;re just thinking Native American art. But there are all kinds of artists and art forms that use turquoise-Persian, Chinese, Tibetan, Mexican-and their turquoise art is sold around the world. The place where you get the highest prices for turquoise right now is Japan. It&apos;s just stunning to most people that turquoise is global. 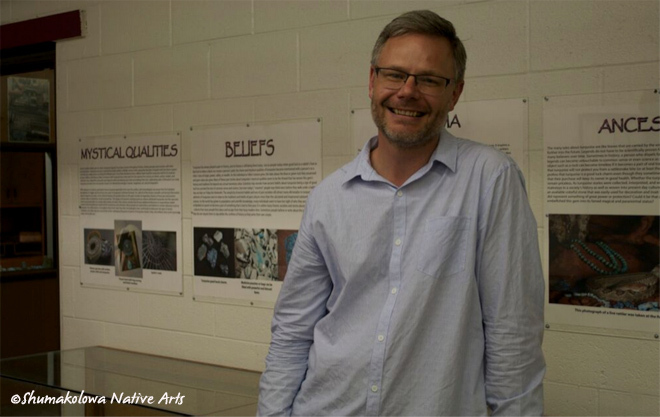 Joe Dan Lowry, author of Turquoise: The World Story of a Fascinating Gemstone, at the Turquoise Museum in Albuquerque, New Mexico. In Native American turquoise jewelry, the jewelry is primary and the turquoise is secondary. If you go anywhere else in the world, turquoise is primary and the artistry is secondary. For example, when you go shopping for a diamond, it&apos;s not about the setting. It&apos;s the diamond that is going to tell you what the price is. America and the Southwest have done an incredible job of marketing the artist. But the frustration now is that since we&apos;re a global world, the prices the world pays for turquoise is much higher for the best than the American market is willing to pay. I don&apos;t work from an agenda or a list in my seminars and tours. I work from the questions I get and I try my best to bring you knowledge, and knowledge about where you can access more information if you&apos;re interested. I also want to know what other people think, what you&apos;ve been told about turquoise. I&apos;m learning too. We all learn in the moments we live. This is my family&apos;s history that I&apos;m trying to protect for history. Turquoise is my tool to meet the world. I get to travel the world and meet people all because of what this gemstone has offered the world. In the Southwest we get to feel and touch our history and the people who represent it. That is so cool. It&apos;s not all high-society, let&apos;s put on a bow-tie and go to some event. Our events are like "Hey, long time no see! How&apos;s the family? How you been?" Institutions are only as valuable as the people who part of it. When an institution allows the people who are part of it to be who they are, then the institution is always stronger for it, and the Indian Pueblo Cultural Center does that. 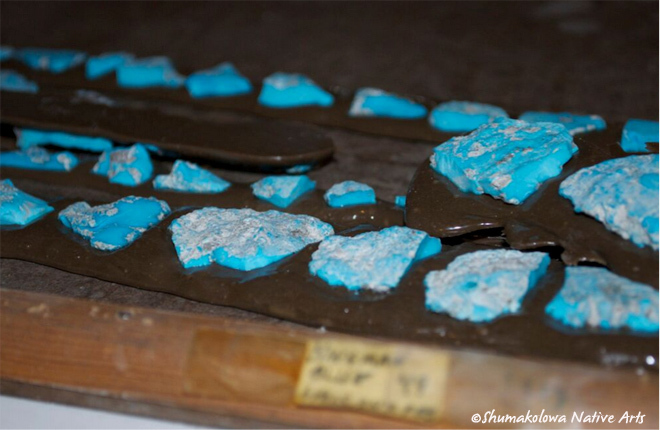 Raw turquoise ready to be shaped in the Turquoise Museum&apos;s cutting studio. What I would say to people interested in buying turquoise and turquoise jewelry is that the best thing is to buy is what you like. Always buy what you like for the right reason, and the right reason is defined by you and nobody else. If you want to buy a piece of jewelry because it matches your shoes, that&apos;s great. If you want to spend $65,000 on a rare piece of jewelry by a rare artist, that&apos;s good too. Buy what you like. 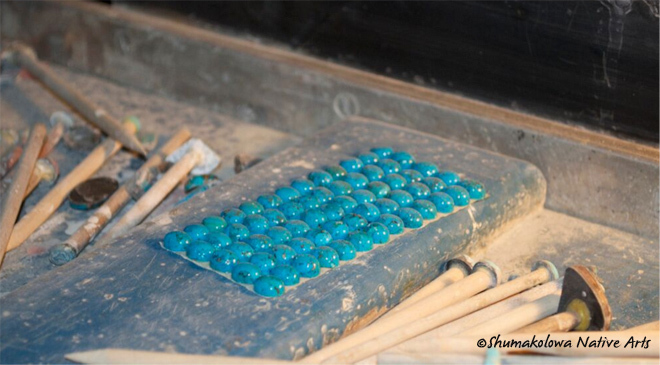 Turquoise cabochons ready for setting. 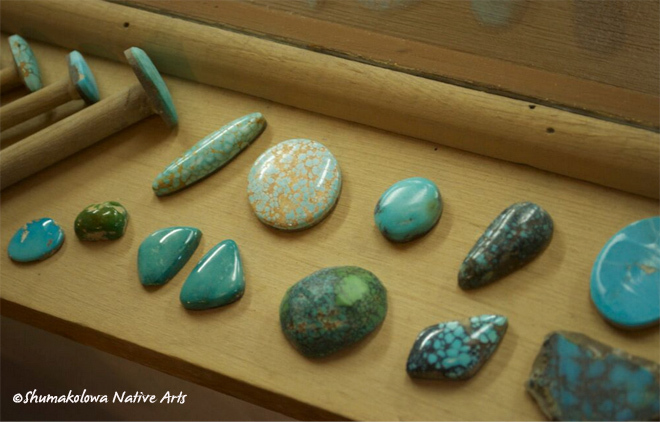 Visit the Shumakolowa Native Arts website or attend a Turquoise Museum tour for more information on turquoise in Albuquerque. Don&apos;t forget to sign up for our ABQ365 e-newsletter for monthly events information in Albuquerque and use the hashtag #AskABQ on Twitter to get your ABQ-related questions answered by local experts! The Indian Pueblo Cultural Center is a world-class museum and cultural center located in the historic Albuquerque Indian School District just minutes from Old Town and Downtown Albuquerque. Founded in 1976 by the 19 Pueblos of New Mexico, it is a leading destination for education, art and entertainment. The museum offers an exciting schedule of cultural and community activities, including rotating museum exhibitions, artist workshops, children's programs and the annual Albuquerque American Indian Arts Festival. The IPCC is also home to a top-rated restaurant and café that blends traditional and contemporary flavors into an innovative menu, and a gift shop that is a trusted destination for authentic handcrafted Native American art. The Indian Pueblo Cultural Center is a vibrant place for people of all cultures to share, learn and discover.